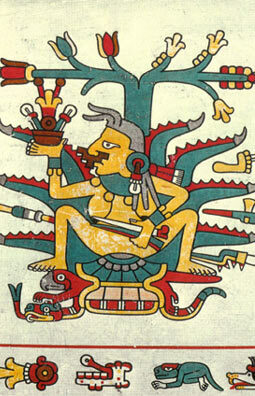 "Codex Laud is presumably Cuicatec or Mazatec from southern Mexico. It was painted at two distinct periods, and covers were added at a third point of time. The main portion of the paintings remains in a perfect condition. There is no defacement of any symbol or human figure in this portion of the work. The surface has lost any gloss cover but has a slightly crystalline texture which gives the painting great brilliance. Codex Laud is a book of religious instruction. It contains eleven sections, one of which deals with the passage of the human being through life, and two with priestly initiation. Its only previous publication was from tracings of A. Aglio in Kingsboroughs Mexican Antiquities (1829)." Graz 1966. Vol. 11 of the series CODICES SELECTI. True-color facsimile edition of the hand painted manuscript in possession of the Bodleian Library, Oxford. 48 folded pages. Format: 165 x 155 mm, total length: ca. 4 m, folded continuously in PreColumbian screenfold format. English commentary by C. A. Burland, 42 pages text, 1 folded plate and 2 black and white plates.